Rhino 3D or Rhinoceros is one of the most versatile 3D CAD and NURBS Modelling program around that is widely used by professionals in many disciplines such as product design, marine engineering, architecture, landscape and interior design. Rhinoceros Visualisation and Rendering is a 100+ page book that covers realistic renderings using Rhino’s own set of ray tracing features. As of this writing, it is the only book (anywhere) that explores Rendering and Visualisation using Rhino 6’s inbuilt Cycles Rendering Engine and the creation of customised shaders & materials using node-based (Grasshopper) configurations. If you are looking to use Rhino as a rendering tools (in addition to its already powerful modelling toolsets), this book may be of use and benefit. This 3D graphics book can be purchased from Amazon. 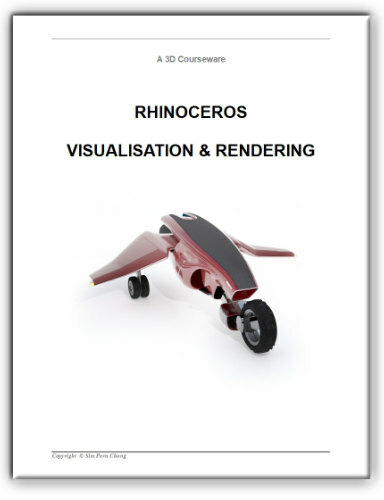 Click here for details on Rhinoceros Visualisation and Rendering Book.